Well, I've been absolutely beside myself about some new stamps that I couldn't show ya'll....until NOW!!! Yep, My Favorite Things is going to debut an exclusive new line of stamps this Wednesday, November 4th (it's November already!) called Pure Innocence. Isn't she so cute? There's actually going to be five different little sets, each with a little girl and one or two sentiments. I've had so much fun playing with these sweet little girls! I have a few more cards and projects that I made with them that I'll have to show ya'll a little later (probably at the release party!). This little Pure Innocence set is called Flower Girl. I wanted to make her bright and use some fun colors, so I went with my favorite--YELLOW and then added some other brights along with it for good measure! There's LOTS more sneaks to see from some of the other MFT Design Team. You can get a list and links over on Kim's blog HERE all week for a plethora of Sneak Peeks of the plethora of sets coming this WEDNESDAY! 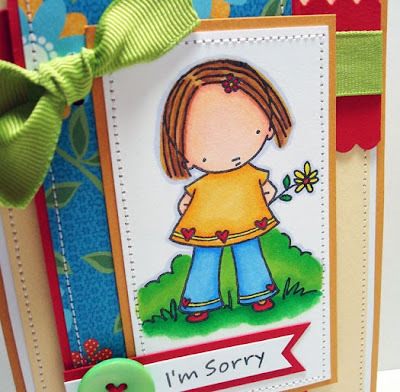 I have to admit, the whole time I was making this card, this OLD song by Brenda Lee was going through my head....'I'm sorry,...So sorry...'!! I am SO not old enough to know that song!!! There. Now it can be in ya'll's heads all day. Just say you're sorry and get on with it, girl! SUSIE Q-TIP: Use thin strips of cardstock to thread your buttons (if you absolutely cannot stand them to be naked). Just thread them from the front with two separate pieces and trim the ends if you want to. The glue dot not only secures them in place, but also makes for easy attachment to your project. This way, your "threading" will always match. 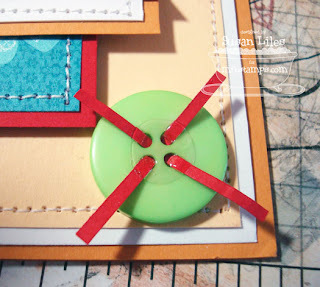 love the tip for the card stock thread in buttons. I gotta have this little girl, she's too dang cute. I'm in love with these new stamps!!! I love using the thin strip of paper to do my buttons, too funny, but the card I posted today uses that as I didn't have any thread that matched. 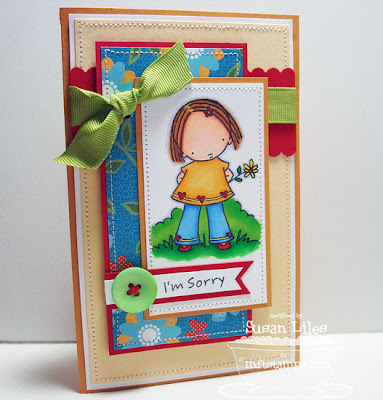 Love the colors on this darling card, Susan!! What an ingenious tip! LOVE your card Sus!!! She is adorable. Love the color combo! OMG this is adorable!!! I Love everything about your card, the cute image, the fun bright colors, papers you name it! Hi Susie! I love the colours you've used in this - bright and cheerful! I just love this card, Susan!! It's so cheery and colorful! susie...this is so stinkin' cute! your coloring is fabulous, and the color combo is so bright and cheerful! Absolutely adorable! I am just loving this new line from MFT! Precious! Love the happy papers and colors! Perfect for this little sweetie! This is such a cute stamp and love the bright colors. Can't wait to see the others in the collection. Where are these stamps sold? very nice love your work and your tips are so good. Also love your humor. Very cute - bright and cheerful. Great idea for the button 'threading'!!!!! Way too cute! I'm in love with these little girls. this is just cute and adorable susan! the color scheme you used is such a wonderful ray of sunshine in the darker colors of fall! one of my favs this week! I love your tip for the card stock thread.... you are very talented girl! !